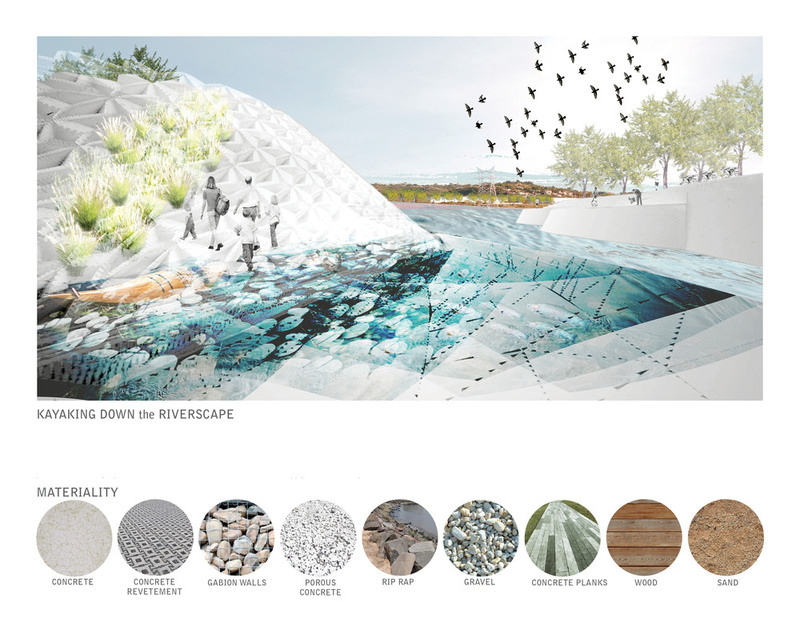 The Los Angeles River is re-envisioned as an urban estuary- the confluence of people and natural systems into a cohesive network that unites neighborhoods and ultimately the entire city. Our connection to nature is re-established by making access to this hidden resource as permeable as feasible, and by creating a network of meandering experiential pathways within the middle of the river itself. Neighborhood pocket parks reclaim adjacent vacant parcels along the existing bike path which further integrate the river with its existing fabric. The existing concrete banks are replaced with tiered upper and lower park zones which create intimate opportunities to inhabit and engage the river edge as well as public spaces to gather in the river bank with protected troughs for vegetation. A variety of natural habitats are created for land and aquatic life through a cluster of islands and pools of varying elevations and depths that treat water as the living organism above, beneath, and within its surface matter. The islands are part concrete, part porous concrete, part custom concrete block revetement system and serve multiple functions - they direct water into separate channels to create habitat, create opportunities for active and passive recreation as well as assist in the mitigation of flood waters. The upper portions are made of open celled concrete blocks of various sized apertures which allow vegetation to nest in as well as receive rising flood water that temporarily detain the additional water volume until the flood water level subsides. These surfaces act like sponges which absorb the additional water volume during storm events. The bottom portions are made of porous concrete, and through gravity, the detained water is slowly released to support the surrounding aquatic habitat as well as serve as additional water supply for the various planted ecotones. Through the development of a three channel system, rapid, meandering, and placid water velocities further encourage various habitat environments. The three channel system also allows for a variable flood plain which increases the effective channel width as needed. The configuration and treatment of urban edges are conceived of as curvilinear and convoluted compressed zones which foster habitat diversity in plant and wildlife. Ecological processes are incorporated to treat urban storm water run off through a series of phytoremediation filtration terraces, basins, and runnels. Natural phenomena such as erosion, scouring, and sand deposition are explored as dynamic processes which inform the morphology of a new channel configuration. The islands, pools, and barrier reefs serve as sculptural armatures which engage these powerful processes and provide the framework that allows nature to re-establish, take hold, and self evolve while assisting in the redirection and mediation of flood waters during storms. Sand and sediment deposition are encouraged as means of natural succession to this man made intervention. The design self evolves beyond its initial frame work through the forces of nature.